A couple of months ago, my laptop's charger died, and I suddenly found myself in a computer crisis. (At the time I thought it was the battery (again--this machine has killed 2 batteries so far), hence my frantic search for a new machine, but it turned out to only be the charger--it turns out I have access another one I can use in the meantime.) I needed a dependable machine; one that was good for every-day tasks such as browsing, e-mail, documents, and of course blogging, but also good for programming and other tweaking I like to do. I had been keeping my eye on the market for about a year, and so I decided that then was the time (even though I knew Haswell was just around the corner--silly me). I was very interested in Windows 8's new touchscreen features. I tested the beta builds of Windows 8 on my laptop, and I found them to be very fast and stable, but I determined that the "Modern" interface (a.k.a. "Metro") was pretty much useless without a touchscreen. Nevertheless, touchscreen is the future of computing interfaces, but by the same token, keyboards and mice/trackpads are also the present state of computing interfaces in Windows. I definitely needed both, without compromise. 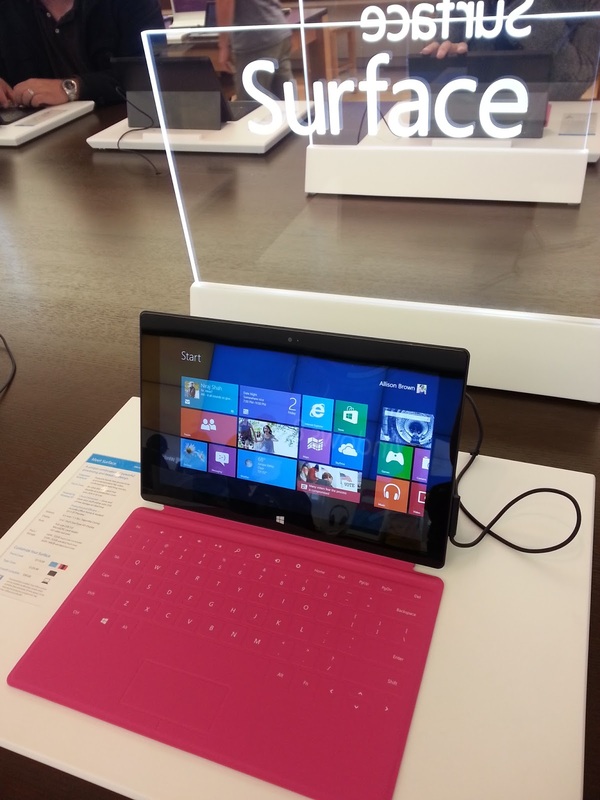 The Microsoft Surface Pro was too inflexible as a laptop device--the "Touch" keyboard is worthless to me, and even with the "Type" keyboard, the screen is only supported at one angle, and then only when it's on a flat, stable surface. No, thank you. I really liked what I saw coming out of Lenovo lately. The Lenovo Yoga 13 looked pretty awesome (I had tried it at the store), and the Helix looked amazing, but it wasn't out in the U.S. yet--or was it? It wasn't for sale on Lenovo's website, but I was able to find it from small sellers at Amazon and elsewhere. After looking around for the best price at a somewhat reputable retailer (as far as I could tell) I found a site with a coupon code that was out of state (no tax), and bought it. I was very happy with the touchscreen interface, for the apps that were available. I found the selection of touchscreen apps barely adequate, but that situation will improve with time and consumer adoption. There were a few kids games that Shoshana in particular loved to play, and the tablet form factor (and tent mode, and stand mode) is a great feature for kids. In daily use, switching between touchscreen input and keyboard/trackpad input was as natural as switching between mouse/trackpad and keyboard input on a 'traditional' machine: I was able to use whatever seemed appropriate and convenient to the task at hand. I didn't find myself using trackpad gestures, since the screen itself was a more intuitive place. Trackpad gestures will probably be more useful to someone with Windows 8 and no touchscreen (which I don't recommend). Similarly, I completely ignored the "hot corners" functions of Windows 8, since those are built as a way for mouse users with no touchscreen to do tasks built for a touchscreen. To make a long story short regarding my ownership of the Helix, I was sent a unit with a French AZERTY keyboard dock. 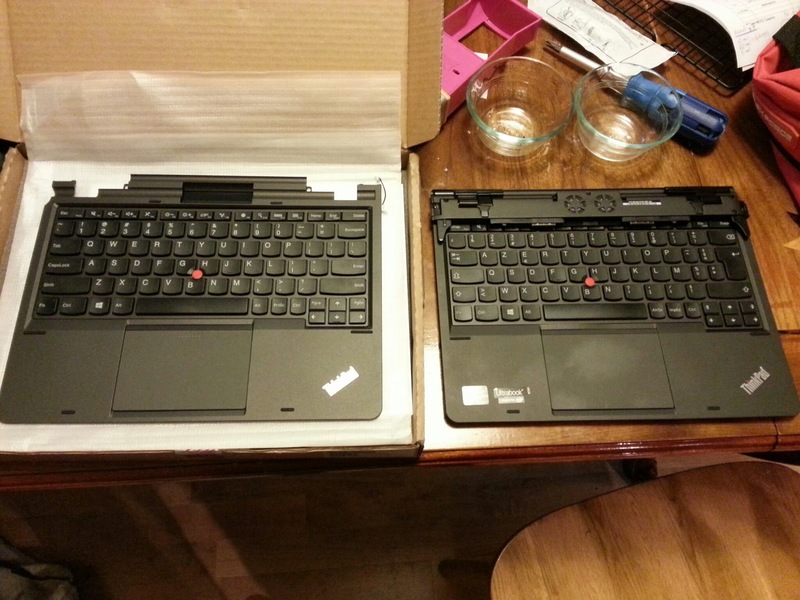 I opened a support case with the retailer, and with Lenovo. I was sent the QUERTY keyboard part, but with no way to open up the base unit and install it (without breaking anything), I had no choice but to simply send the keyboard back to the manufacturer, and send the Helix back to the retailer. The detachable screen form factor was pretty awesome, though I did end up taking the base with me everywhere even if I wasn't using it. "Stand mode" is great for using the touchscreen at an angle on the lap or a table. In laptop mode it seemed top-heavy due to the "behind-the-glass" design, but this was never a real problem. The 1080p screen was simply too small for the Desktop interface at 11 inches. This is a fault of Windows 8, not the hardware. DPI settings are simply ignored by too many apps. The text was too small to read comfortably. The 13" Yoga is looking pretty good in that regard. The stylus was nice to have, but with a trackpad not really necessary. The Windows 8 Modern UI app ecosystem is lacking. This may improve with time. BlueStacks is too cumbersome to really use for touchscreen apps. Using the mouse buttons on the bottom corners of the rocking touchpad was wonky, and never worked the way I expected. The function keys F1-F12 were toggled to their auxiliary functions by default. I had to hold the function key down to get them to work as themselves. The function key was located where I expected the control key to be and vice versa. One thing that surprised me was that I didn't like the pixel density. I have pretty good eyes, and I have always sprung for the highest resolution displays that I can get on my laptops. I have been very put off by all of the new computers these days with 1366x768 displays. 768 vertical pixels is equivalent to those 1024x768 displays we all had with Windows 95 on our 11" 3x4 monitors. It's worthless for multitasking, or for reading text, and especially for editing code. It simply will not do. I was surprised, then, that 1920x1080 pixels was too small for me to find useful. Yes, I could see everything, but I had to concentrate to actually read it one line at a time. This also would not do. So no longer can I simply say "increase the pixels"; I must find the right balance between screen size and pixel density. Equivalent size at 1080p 16x9 128.6 ppi would be 17.1"
The best pixel density per inch seems to be in the 140 range, not the 190 range. If I want a 1080p screen, I'll need to go with something larger, like the 15.6". If I want something smaller, I will need to sacrifice some screen real estate. Suddenly the Yoga 13's screen resolution transforms from a disappointing spec to a sound product design decision. If it gets jostled the wrong way, the screen goes dark and everything is unresponsive (ever since the hinge broke). Battery life is down to about 40 minutes on a full charge. Not to mention its 6-year-old specs. ...but I'm hoping it will hang on until I see what the new Haswell chips can do in a transformable laptop in the 15" range. I don't want to feel like my new computer is a downgrade. With the Helix's small screen, that was definitely the case, even with the increased pixel count.